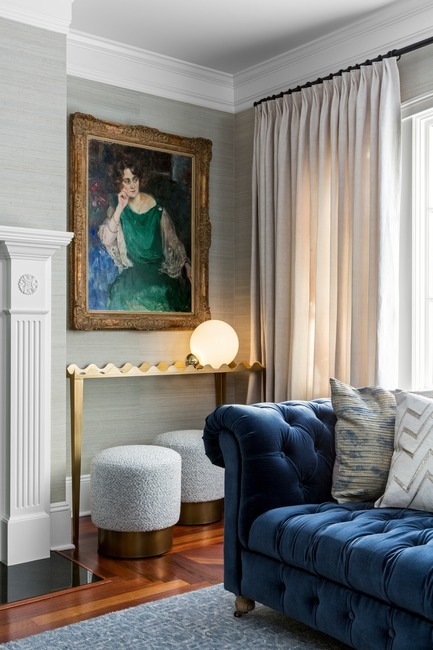 KNOF Design has created an elegant, colourful and layered interiors scheme for a private family home that merges a recently married couple’s tastes, in the form of classic French interiors and the geometry of the art deco period. The new scheme is for a 6-bed, 6,500 sq ft property in Mountain Lakes, New Jersey, which is part of a 4,000-strong lakeside community located within the Manhattan commuter belt. 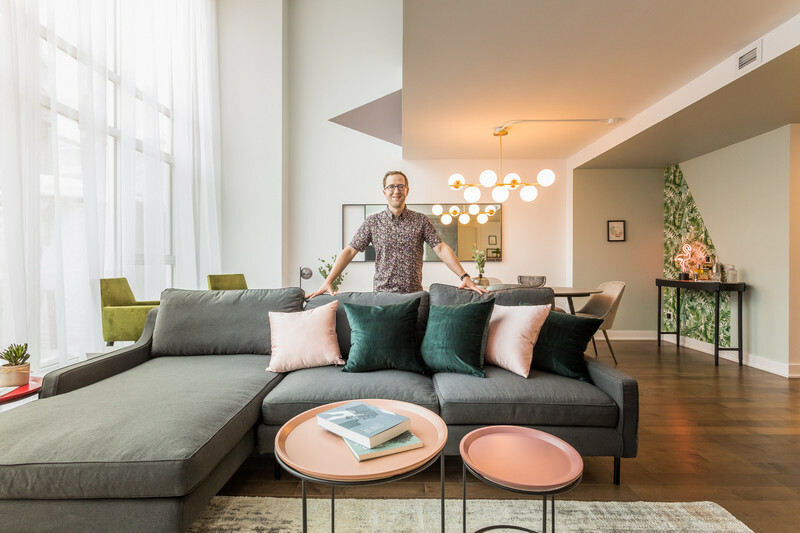 The project also had an emotional aspect for Susan Knof, Founder and Creative Director of KNOF Design, as one half of the client couple is a long-time friend. “It was inspiring and special to know how significant the new home was for my friend, representing, as it does, the creation of a solid base for her new life chapter”, Susan Knof commented. 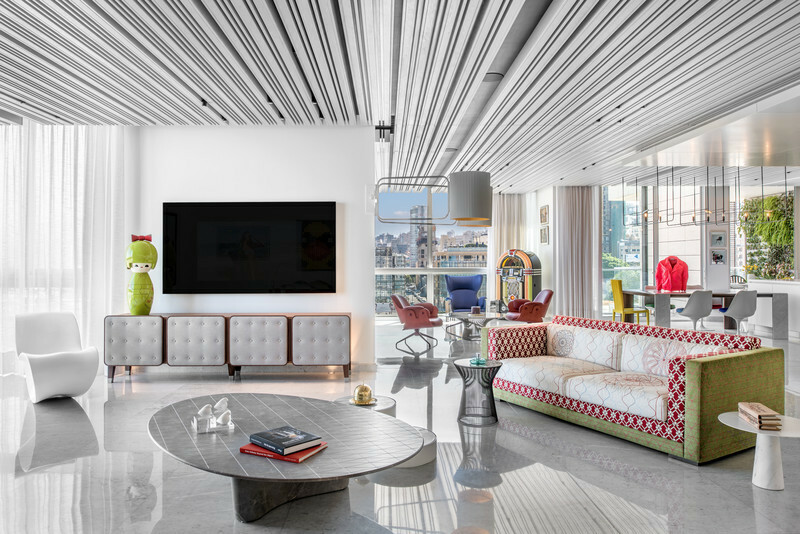 The scheme wasn’t just an interior for the couple, however, but also for their collective six children from their first marriages, as well their newborn baby son. “Several of the older children are full-grown and were only likely to be visiting at weekends or during holidays”, Susan added. “Nevertheless, key spaces, such as the dining and family rooms, had to be furnished for the possibility of all nine family members being present at the same time”. 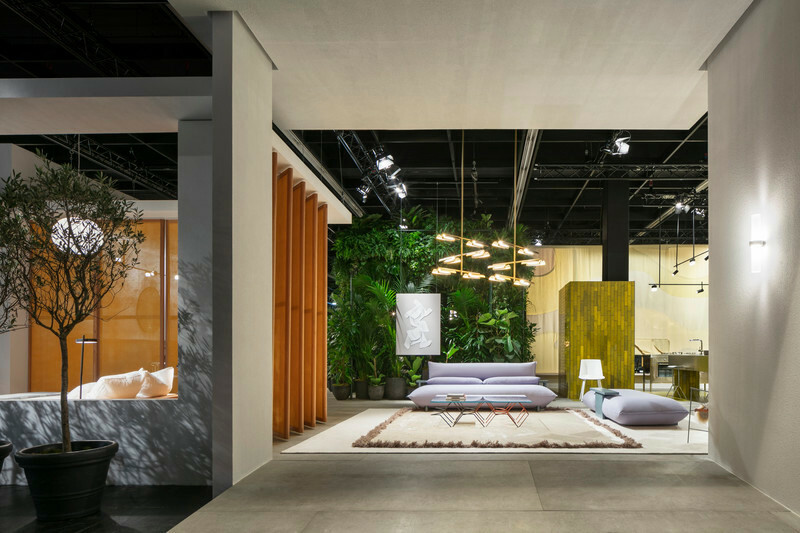 The project was a logistical challenge additionally for the design company Founder, who splits her work life between London and Miami. With additional current projects in London, Sofia and West Africa, this is something of an ongoing challenge for Susan Knof, solved by being very much on the ball in terms of time zones and also having a great international array of key suppliers and teams. Good communication is also key, of course, as well as, in this instance, the pre-existing designer-client relationship and knowing her friend’s tastes and style extremely well. The interior’s brief was fairly minimal, with the couple entrusting Susan Knof with the creation of a scheme that would work with the property’s scale and dimensions, the family’s logistical requirements and their personal tastes, including “her” preference for French furniture and “his” for the lines and geometry of art deco. 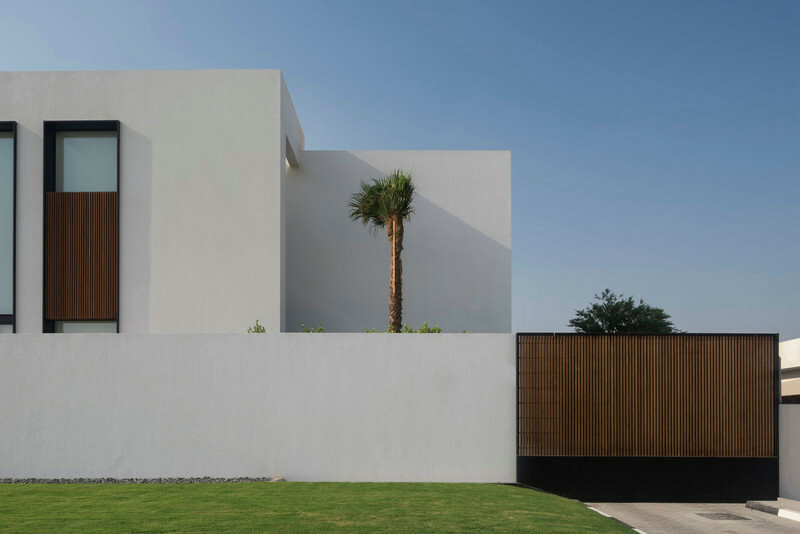 The house is arranged so that it opens up immediately on entry into two formal rooms, with the formal living room to the right and the formal dining room to the left, both are clearly visible one from the other. 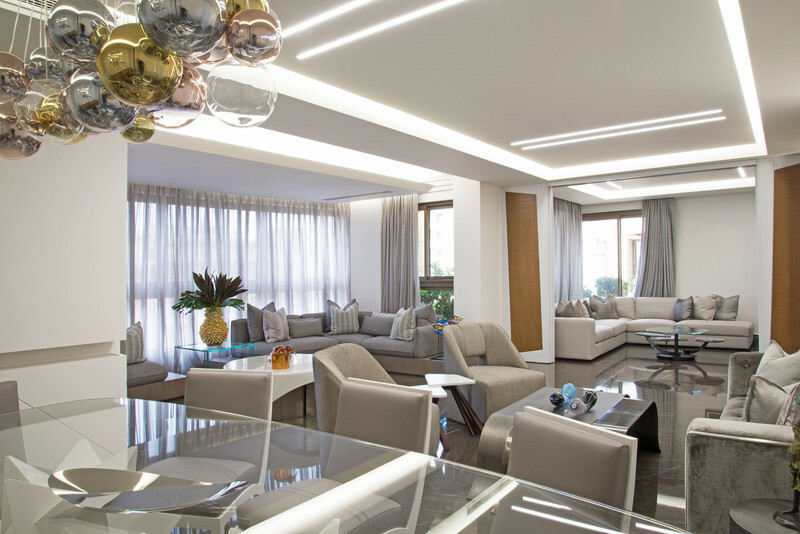 The spaces were designed with a similar, linking palette of colour and materials, including strong blue tones, textured finishes and layering, as well as furniture with a distinctly luxurious feel. 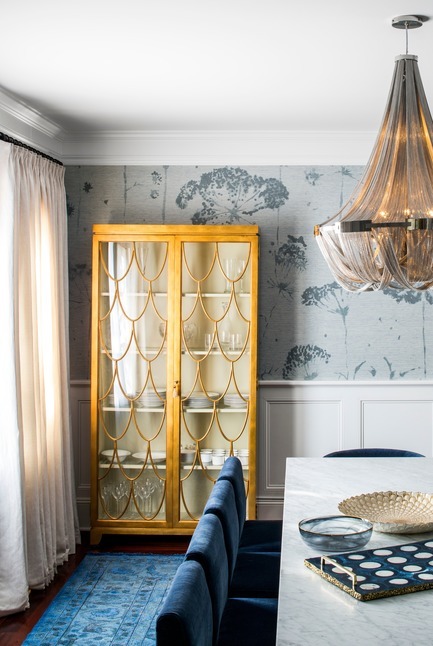 Subtle added glamour comes from dynamic, large-scale floral wallcoverings, metallic finishes in gold and brass and standout chandelier lighting. Both formal receiving rooms also feature highly polished existing timber flooring, with new overlaid rugs. In the formal living room, the rug is by Eloise and is a lightly patterned abstract-style rug in soft blues and greys, hand-knotted in India using denim bamboo silk. The strikingly bold rug in the formal dining room is a vintage piece in rich blue patterns, sourced from ABC Carpet & Home in New York. 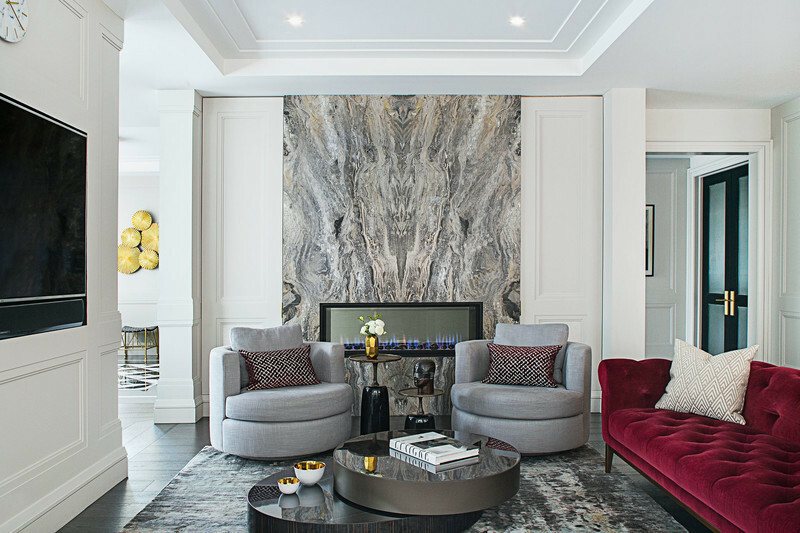 Both rooms also feature stunning woven silk wall coverings from Phillip Jeffries. In the formal living room, the Tirreno Blue Amalfi Silk wall covering is used, whilst a large-scale wild meadow flower print in the formal dining room is the WISH Bright in silk linen. The dining room also features timber half-panelling on the walls and this helps to balance out this strong print and prevents it from overwhelming the room. The curtains in the formal living room are a linen and viscose crystal molecule fabric from Chase Erwin and furniture includes a buttoned Cambridge Sofa in tufted, vintage indigo velvet and two elegant Miles leather chairs in Milano stone leather, with brushed-brass frames, sourced from Restoration Hardware. 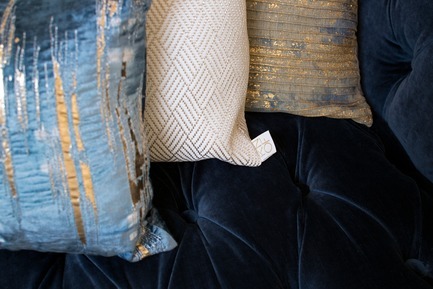 Soft cushions are a playful mix of metallic fabrics, with gold or detailed beading. Some were purchased whilst Susan Knof had four specially made from interesting fabrics sourced to complement the scheme. A striking circular coffee table with a polished-brass frame and black marble top is the Camilla by OKL, whilst a narrow, Margo Scalloped Console against the back wall is in hand-forged steel with a gold leaf coating and mirrored glass top and was manufactured to bespoke dimensions to fit the wall recess perfectly. A white globe Flos light sits on top. The third table in the room is a striking lily pad “Justina” incidental table, with a gold finish and an artfully bent base. Two Theo drum stools by Kelly Wearstler sit alongside the console table and are made up of a burnished brass base and custom bouclé fabric with subtle blue flecking, whilst a two-part nest of tables alongside the sofa is in contrasting shades of faux shagreen in white and charcoal on an antique brass frame. Behind, a Visual Comfort Studio Aspen floor lamp has a natural paper shade and a gold-leafed organic tree-shaped base, continuing the natural references, interesting shapes and metallic finish themes in the room. A grand piano already belonging to the couple is positioned to the rear left side of the room, whilst the final striking piece of furniture is a stunning hand-painted screen in silvered leaves. 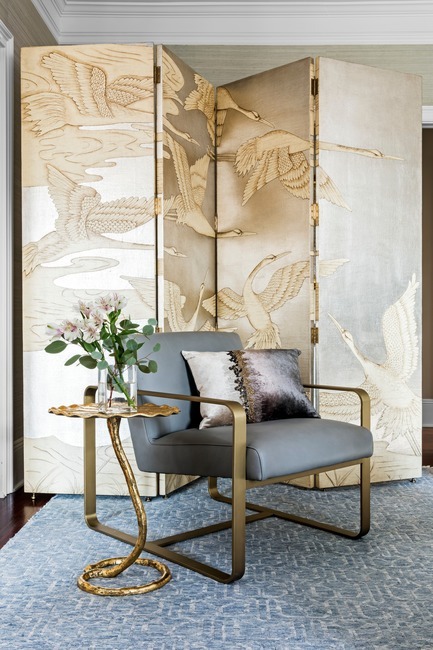 This floor-standing screen, from Argento, features four panels and is decorated sans traverse with Japanese flying cranes, inspired by a Japanese original. The decoration includes crushed eggshell inlays and was hand-tooled with gold leaf. The formal dining room has at its centre a Torano marble rectangular dining table with a white marble top and burnished brass base from Restoration Hardware. 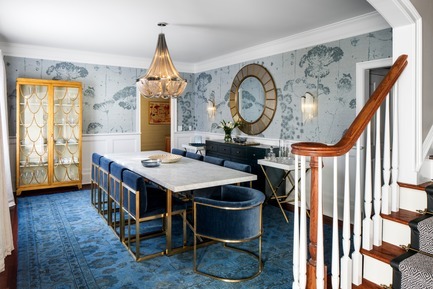 The eight accompanying dining chairs are Wexler Square chairs in indigo velvet with matching burnished brass bases, with two additional Wexler Barrelback chairs at the table ends. 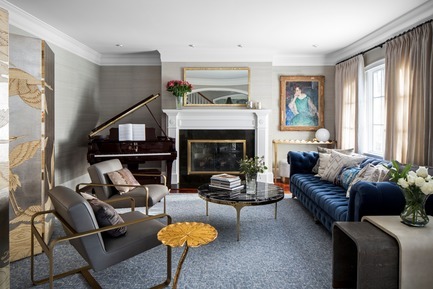 The blue not only works with the vintage rug in the room, but also references the blue velvet sofa in the forming living room. Blue is picked up again in the new carpet up the stair to the first floor, which has a steel grey-blue pattern with leather edging, sourced from Stark Carpets. The eye is also drawn to the back of the formal dining room and its standout piece of furniture: a backlit, gold-leafed Preview-A gilt display cabinet, with an LED-lit, ivory painted interior and four framed and glass-inset adjustable shelves, plus a striking scalloped gold pattern to the front of the glass doors, used to display the couple’s wedding crystal. Lighting in the room is glamorous and dramatic and includes an overhead Soscik chandelier, made up of swoops of interlacing metal chain over a nickel-plated frame. Stream wall lights by Christian Lava for Terzani to either side were handmade in Florence and Sicily and feature metal chain that appears to float down from an undulating nickel-plated frame in cascading tiers. 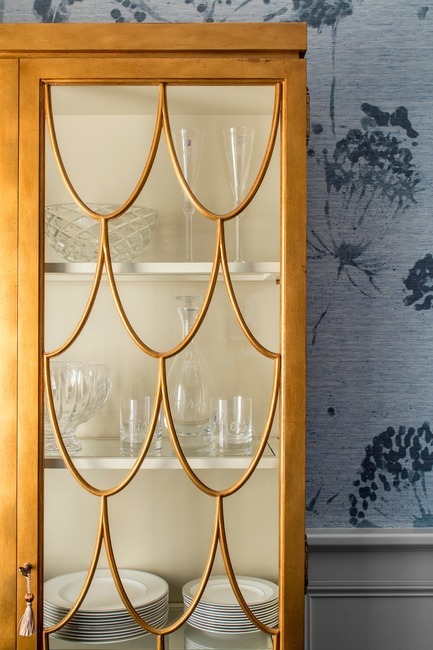 To ensure the room could encompass both with the gold leaf and brass finishes of the furniture and the silver metal of the chandelier, Susan Knof’s final choice was an original, art deco, verre églomisé silvered and gilt wall mirror with a bevelled edge plate that uses and unifies both colours of metal. 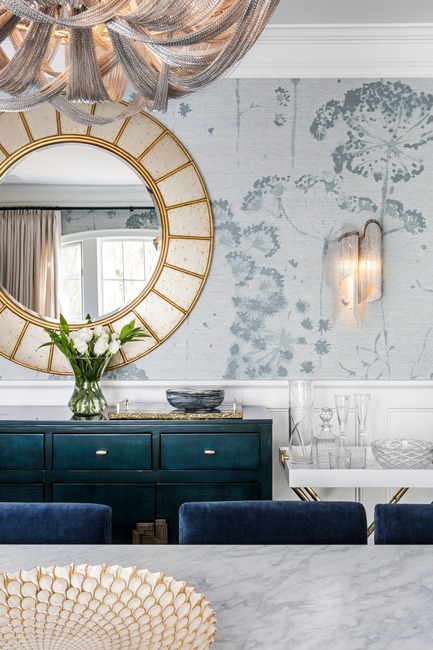 Below it is a washed dark blue console with gold accents (the Curiosity Crendenza by HFH), whilst white lacquer tray tables with antique natural brass accents alongside, by Jonathan Adler, add a more contemporary note. Curtains are once again a linen and viscose crystal molecule fabric by Chase Erwin. The third major living space is a more informal and intimate family room, which looks out onto the back lawns and where a quieter and more neutral scheme can be seen. 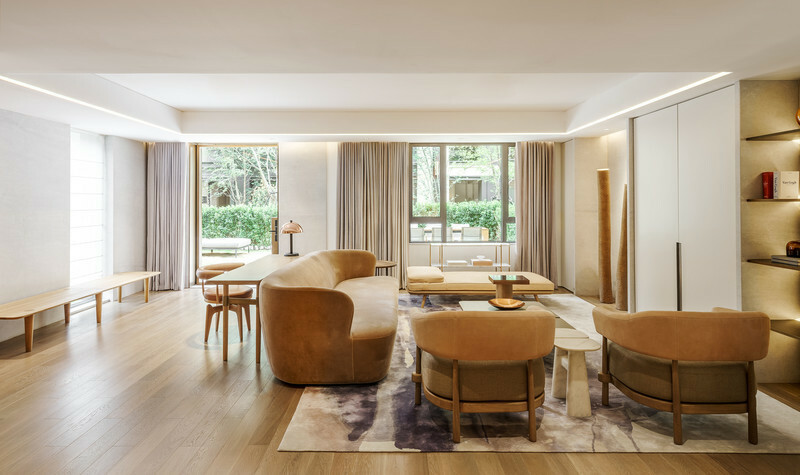 The plan here had to be very functional to encompass all the family at leisure time and is centred around an enormous sofa: the Poliform Bristol Sofa designed by Jean-Marie Massaud and upholstered in Paris Avorio with integrated table in Cenere oak. 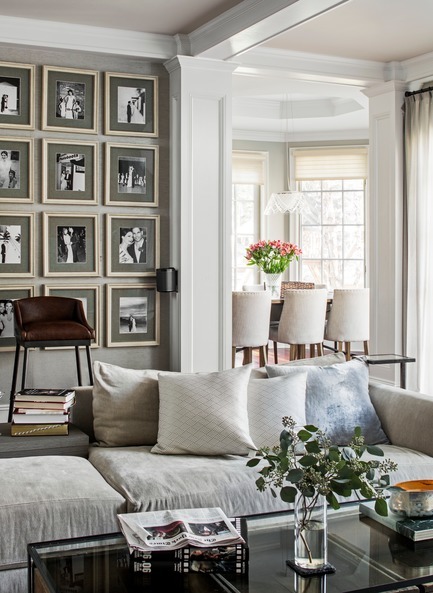 There are lots of tonal greys in this room, including light linen curtains; Phillip Jeffries Canvas Linen wall coverings in Silver Mink and matching painted recessed panels in the ceiling. Furniture includes a Chandelier Longue Chair by Cierre Imbottiti, purchased through DDC in New York, which is a feature piece, handmade with capitonné upholstery cushions on a supporting metal frame and designed Stefano Conficconi. Two Iron Scaffold leather stools, inspired by a mid-20th-century design, with supple leather seats atop a tubular steel base, feature sloping wings and a low camelback and are located to either side of the bar, which takes the form of a leather trunk. The Mayfair bar cabinet is in saddle black leather, edged all around with scores of hand-hammered brass railheads. The lower doors of the bar open onto a stainless-steel interior and are fitted with a shelf for bottles and barware, whilst the hinged top lifts and the front panel drops down, creating a handy spot for crafting cocktails and pouring wine. A mirror beneath the lid showcases the glimmer of glassware and decanters. Behind the bar is a full-height photo wall, featuring professional black and white family photos, with all 32 frames custom-made for the scheme in distressed cream washed timber with a heather gray Belgian linen matte or surround. Other furniture in this room includes a softly tufted dark grey leather Onda Pouff by Poliform and a striking Argentinian-made and super-soft cowhide patchwork rug with a soft leather border, in an array of neutral shades, from tans and taupes to deeper browns. The coffee table in the centre of the room is a glass and iron Mason coffee table, with three reclaimed timber crates by ABC Carpet and Home. ‘The slightly rustic flavour to this room was a conscious decision’, Susan Knof explained, ‘so that it would work with the stone-framed fireplace, which was inherited and deemed too costly to replace. Instead, it’s been given a more contemporary feel thanks to a bespoke-made reclaimed rough-sawn wood mantel on the top’. Fun accessories include the letter M (for the family surname), lit up in lights over one fireside cupboard area, which is used for keeping toys out of sight in the evening, and a movie-style standing light, which is a subtle nod to a family of film fanatics. 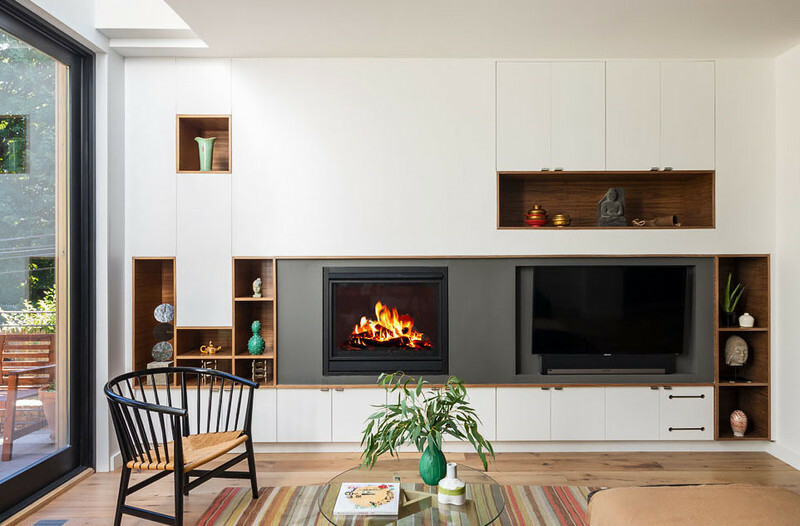 To the other side of the fireplace is a bookcase, given added depth by being backlit, with shagreen-embossed wallpaper to its rear. Upstairs, the master bedroom has a distinct deco feel, with mirrored-accent furniture including an Amelie Mirrored Console in hardwood with mirrored veneers, as well as mirrored bedside tables from Z Galleries. These feature hand-applied silver leaf and silver beaded trim whilst the drawers are accented with brushed silver hardware. Two glass bedside’Abacus” lights are from Mercury and feature a fluted glass body and a lustre-finish iron base with an antique bronze finish and white linen shades. The chair at the vanity table is a vintage French side chair, upholstered in velvet. The room features light linen curtains and Brian Yates Back to Nature natural linen wallpaper. A coffee table is the RH Emelia Round side table, mirrored with an antique-cream finish and silvery accents, extending the glamorous feel of the room. 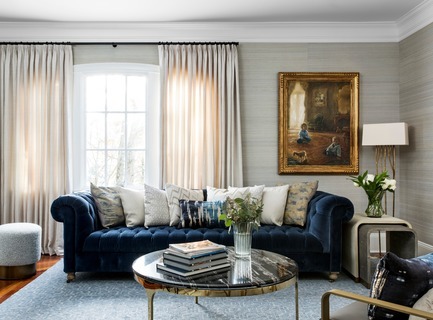 The diamond-patterned rug in the room, over the polished timber flooring, was custom-made by Stark Carpets, whilst the linen-upholstered Bed Blanka has an antique white-washed finish and a grey velvet RH Lous Bench ottoman at its foot. 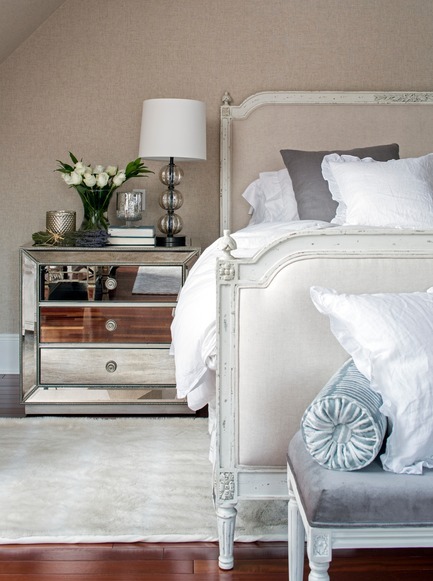 A faux-fur throw is used as an additional rug under and alongside the bed. The bedroom overhead light is a vintage, distressed and whitewashed six-light Salento metal chandelier from Horchow and a floor lamp, also from Horchow is the Arwen Crystal floor lamp. Cushions in the room were custom-made by KNOF Design. The young daughter of the house’s room features a highly textured purple and pink colourway, which includes a large-print, zebra-patterned rug from Stark Carpets in Custom Wild with a spot pattern in light lavender and bright purple and bright purple edge detail. The animal print theme finds further expression in the wall treatment; Cole & Son’s “Folie” wallpaper: a playful take on a French toile with a tropical feel and illustrations of flamingos and palm trees. The furniture in the room all has a vintage French feel and includes a French Empire Play Table and Madeleine Play Chair from Restoration Hardware, plus a Blythe Desk by Pottery Barn Kids in a vintage “simply white” finish, with a mini vintage French desk chair in pink linen. The Colette bed features a kiln-dried hardwood frame from Restoration Hardware, with a headboard in antique ivory Belgian linen and generous bedding in soft lilac cotton, dressed with a custom-made satin bolster cushion and co-ordinating decorative piped purple velvet cushions. Other custom-made cushions in the room are in oyster silks and richer velvets. A zingy table lamp has a pink zigzag chevron ceramic base with a linen shade and sits on a whitewashed timber bedside table. The room features a vintage 4-arm pewter chandelier with glass beads and faceted crystal. Other furniture includes a decorative wall mirror and a Bellina dresser in hardwood with an heirloom white finish, plus an Heirloom White Marcelle tall bookcase. A bespoke giant pinboard on one of the walls is for photos, postcards and notes, made up of silk ribbon diagonals over a subtly textured backing. A fun faux fur polar bear bean bag chair completes the look. 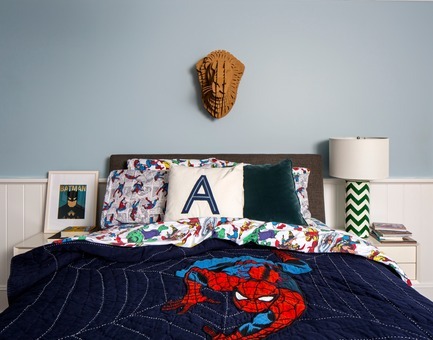 The young boy’s room is a fun room, with playful layers and patterns, including superhero bedding from Pottery Barn Kids on the Ella Bed by Room and Board and a section of great, squiggle wallpaper by Vivienne Westwood in the inset alcove. A bedside lamp, in green zigzags on white ceramic with a Horchow lampshade echoes the one in the girl’s room and sits on white lacquer bedside table from West Elm. Posters, including vintage superhero posters in custom frames line the walls, whilst the toy baskets on the floor are Kneatly Knit Rope Bins. The chest of drawers is a blue, chromatic-three-drawer dresser, whilst the rug in the room is a woven cotton herringbone patter in Swedish blue. 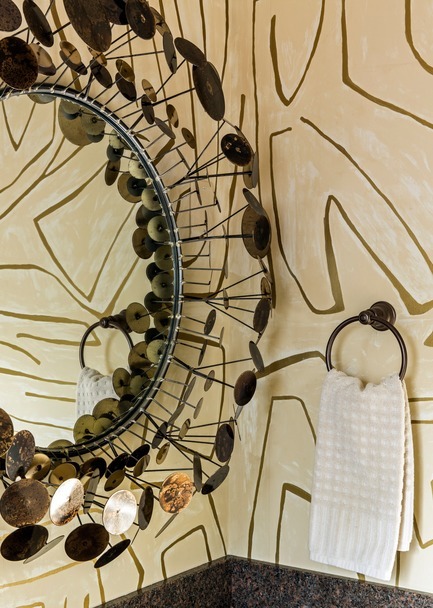 A wall-mounted suspension bridge iron display shelf is by Pottery Barn Kids. 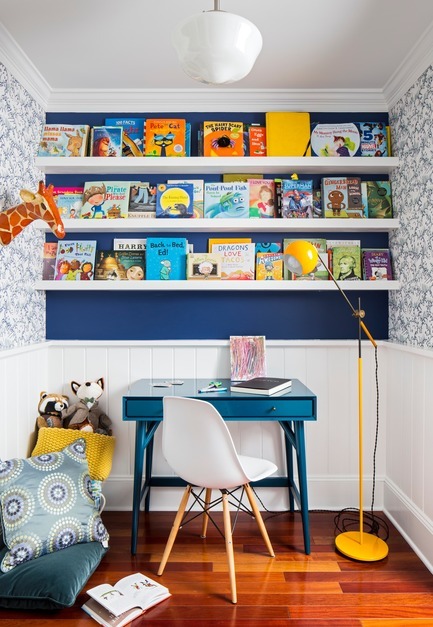 The bedroom has a study nook with custom bookshelves set into the recess. Here, a mid-century mini desk in Thai Blue by West Elm, has a solid eucalyptus wood base and lacquer finish and accompanies a Charles Eames Eiffel chair, with maple base and legs. A stuffed papier mâché giraffe head coming out of the wall is a fun addition, as is the cast iron “Studio” floorlamp in industrial yellow from the School House Electric & Supply Co.
KNOF Design is owned and led by Creative Director Susan Knof, a native New Yorker and international interiors professional, whose work has graced the covers of leading international design and lifestyle magazines. Having lived and worked in New York, Sydney and London, Susan’s background lends a sophisticated and cosmopolitan style to her designs. Susan started the company in 2012 after over 15 years in the architecture and design industry. Susan’s tenure includes roles at large architectural practices, such as Gensler, TPG, and SOSH Architects in New York. 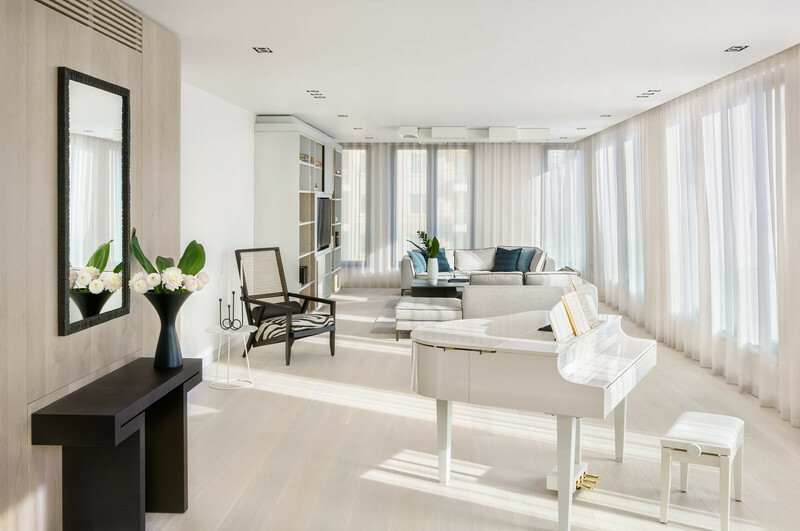 Prior to establishing KNOF design she was a lead designer with luxury London-based design practice, SHH Architects, where she led a team focusing on high-end residential interiors throughout the UK and Europe. She has a BFA (Hons) from Miami University, where she majored in Interior Architectural Design. Susan was an Associate Professor at Berkeley College in the USA and has also done volunteer construction work for “Habitat for Humanity International” in mainland USA and Hawaii. She is a full member of the BIID and is also a LEED (Leadership in Energy and Environmental Design)-accredited professional. In 2011 Susan was invited to be on the steering committee of leading British design publication IDFX.